Although thoracic endovascular aortic repair (TEVAR) has changed the treatment strategy of descending aortic diseases, unlimited and uncritical adoption of this approach for all aortic pathologies is questionable. The increasing use of thoracic stent grafts for different aortic diseases has resulted in numerous relevant complications, which have required reintervention. The significant complications include development of endoleaks, retrograde type A aortic dissection, aortoesophageal and aortobronchial fistulae, stent graft infections and malperfusion syndrome. Many of complications could be resolved endovascularly with satisfying long-term results, whereas other complications such as retrograde type A aortic dissection and aortoesophageal and aortobronchial fistulae should be recognized and treated promptly by open surgical repair. 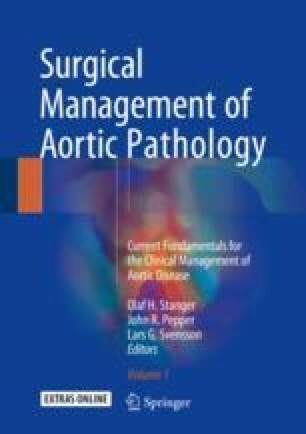 This chapter reviews the epidemiology, etiopathogenesis and diagnosis of the main complications after thoracic endovascular aortic repair and about the treatment strategies.